I would like to simulate a graphics tablet (like wacom's ones) from a script. The "good" way to proceed seems to use libevent that is an abstract layer above uinput. So I tried to write a script that sends some event like EV_ABS.ABS_X or EV_ABS.ABS_PRESSURE, using the python library of libevent. Unfortunately, when I use Krita/Gimp/... to test it, the line that it draws does not change it's shape depending on the pressure, and xinput test-xi2 does not display any pressure event. Any idea why? 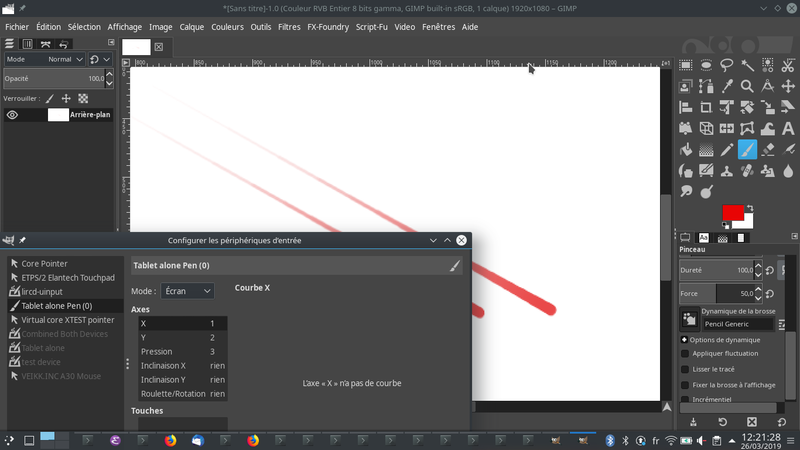 or open Gimp, go to 'Edit/Input device' and configure the device 'Tablet alone' to 'Screen', save and close the pop up,create a new file (Ctrl-N), Zoom and press 'tab' to have a drawing surface covering most of the screen. Switch to brush using 'p' key, by making sure the brush is set to Pressure size. What I expect: a line whose size is not constatn (the script increase the pressure linearly), or to see some pressure-related events on xinput. # nothing is ready to listen to the device yet. After some time and doc/code reading, I finally found the solution. and libevdev.EV_SYN.SYN_REPORT that must be sent every time your send a block of information. If you don't send this, the kernel will not proceed the events, or with a very slow rate like 1/s. If you test with Gimp, make sure you open your software after xinput is able to list it, otherwise it won't be listed in input devices and you will need to restart gimp (note that you can then restart the script without restarting gimp). You also want to set in Edit/input device the device Tablet alone to Screen, and to choose a brush whose dynamic is set to something like Pencil Generic like in the screenshot. For the script to work, you may also want as well to press Tab to have a wider drawing area (Tab again to come back to normal window), and to zoom until all the area is covered. ### in order to recognize the device as a tablet. # Say that we are using the pen (not the erasor), and should be set to 1 when we are at proximity to the device. # the pen. Otherwise, it won't write anything in gimp. # strange things during the first draw. Not the answer you're looking for? Browse other questions tagged keyboard tablet or ask your own question.